I was a little bored as I was starting up the work computer the other morning so I snapped this picture. 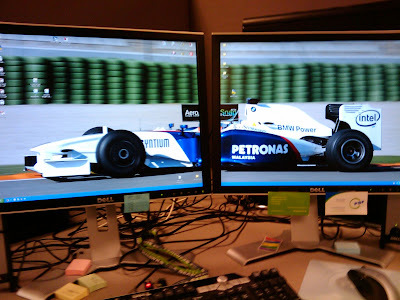 A wallpaper of Robert Kubica ripping around in the BMW F1.09 that I had to chop to my unusual screen setup. My new pack of multi-colored 3M stickys. A little reward to myself for using a pad up from start to finish without losing it for the first time in my professional career. My new cord management program. The things are multiplying. I started out with five (four for the monitors, one for the keyboard) and now I have eighty-three. What the hell. I need to start harvesting some for profit! Aerosnap. Was ist Aerosnap? AeroSnap ist eine kleine aber mächtige Anwendung, die es Ihnen erlaubt, die Fenster auf Ihrem Desktop alleine per Drag'n'Drop zu arrangieren, in der Größe zu ändern oder zu maximieren. Translated - Aerosnap is freaking awesome if you have a dual monitor setup. If I grap a window and drag it to the top of my screens, it maximises across both monitors. Drag it to the side, it maximizes in one monitor. Bitchin! Okay, I'm sure that you don't care, but I totally understood the German that you cut and pasted onto your blog...thank you WWU German Minor! I forgot, you get all your info from the kos and JS.